small mosaic tiles, but after only six months, they began to detach and fall. A solution was needed, and a company called solarcentury came up with a clever idea replacing the failing tiles with solar cells. 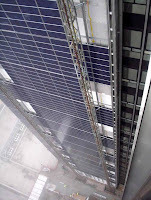 Not only do the solar cells provide a weatherproof barrier, they also generate about 390kW of power for the building. In total, 7,244 Sharp 80W modules are used to cover the entire service tower (but apparently only 4898 of these modules are "live" the others are "dummy modules" — strange). 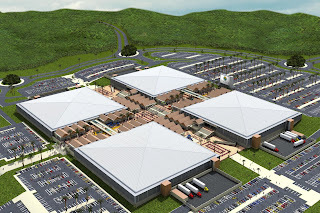 The building also has 24 wind turbines on the roof, which provide 10% of the total power used by the building..."
The recently opened Tinapa business resort was designed by this interesting Architectural firm based in South Africa. 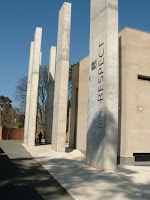 According to their website"...GAPP Architects and Urban Designers has evolved to become one of South Africa´s foremost professional firms, with an award-winning portfolio of work in high profile and prestigious projects such as: The Apartheid Museum, The ArabellaSheraton Grand Hotel, The Western Cape Hotel and Spa, The Park Hyatt, Maropeng at The Cradle of Humankind, Freedom Park, The V&A Waterfront and Nelson Mandela Square to name just a few. GAPP´s philosophy which encompasses a culture of mutual respect and open communication is apparent when visiting any of the offices in Johannesburg, Cape Town and Durban and the network of satellite offices in Port Elizabeth, Nairobi, Dar-es-Salaam, Calabar and Mauritius. The GAPP team is defined by some of the most respected accomplished individuals across a complementary range of skills in the fields of Architecture, Urban Design, Urban Development Strategies, Services Design, Information Technology and Town Planning, together sharing space and ideas in a stimulating and well-organised work environment. These aspects combine to provide a sound basis for GAPP to maintain the highest professional standards from design excellence to client collaboration and in so doing, to create a built environment which stands as a legacy now and will for generations hereafter..."
The birsel + seck Company was started by Ayse Birsel and Bibi Seck who are both product designers. "...Their award-winning designs span the office, home, bath, retail and automotive sectors..." which include the well know brands like Herman Miller, Hewlett Packard, Target, and Renault. Their website says "...Bibi Seck was born in Paris and spent his formative years in London, Paris and Dakar. He received his Master’s degree in industrial design in 1990 from ESDI, Paris. Before moving to New York in 2003, Seck was lead designer at Renault for 12 years and has extensive experience in materials and manufacturing, and guiding large design teams through complex problems. Seck led the interior design teams for several production vehicles, including the Scenic I, Twingo II, Trafic, and Scenic II. Scenic I (1996) and Trafic (2002) won Car of the Year awards from the European trade press. While at Renault, Seck designed the F1 Micrograph watch for Tag Heuer, winning the prestigious 2002 Prix d’Horlogerie de Genève. Seck has taught at Strate Collége School of Design and Management in Paris, at Université Technologique de Compiegne, and most recently at Pratt Institute...."
"...Ayse Birsel grew up in Izmir, Turkey. In 1989 she received a Fulbright Scholarship to complete her Master’s Degree at Pratt Institute, Brooklyn, NY. Her 1993 design of the Zoë Washlet spearheaded Japanese manufacturer TOTO’s entry into the US market and has unofficially been coined the world’s most comfortable toilet seat. In 1996 she founded Olive 1:1. Birsel received a gold Industrial Design Excellence IDSA award for the Resolve system, her reinterpretation of the office cubicle for Herman Miller. In 2002, her collaboration with Bibi Seck on the design of a concept automobile interior for Renault led to the creation of their studio Birsel + Seck. collections of Cooper Hewitt National Design Museum and the Museum of Modern Art..."
in Nigeria's growing real estate industry. 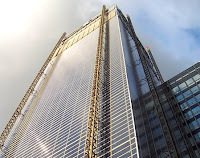 I attended the lecture by Marks Barfield Architects, The Quietrevolution, and Price & Myers at the building centre about the Beacon which is part of the Sustainable London, Power in the City lecture. It was an impressive presentation and the duo Julia Barfield, joint Managing Director of Marks Barfield Architects, and Robert Webb, CEO of Quietrevolution were bombarded with a lot of interesting questions by the full house audience, which I think were answered satisfactorily. The quietrevolution website says "...The Beacon is a 40 metre high Y-shaped structure, and is designed to be ‘planted’ along major roads and public spaces, reaching up to the stronger breezes above London’s buildings. 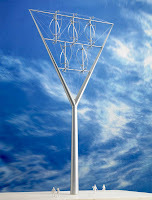 Each Beacon supports five vertical 'triple-helix’ wind turbines called quietrevolution, each five metres high and three metres diameter designed to achieve ultra-quiet operation and more efficient utilisation of urban winds. through transmission. We believe cities like London should take much greater responsibility for their own energy generation. London has a unique opportunity to make a difference in time for the Olympics’ said David Marks and Julia Barfield, co-designers of the Beacon. Their partner in the project, Robert Webb, CEO of XCO2 and co-designer of The Beacon adds; ‘Within fifty years we will be living in a world which is 90 percent powered by renewable energy", with no sacrifice to quality of life. The Beacon is a showcase and a celebration of this revolution and is designed to bring the debate on wind generation directly into the cities..."
Link to Sustainable London PDF presentation. Prism Designs Africa is an indigenous architectural design firm that specialises mainly in residential, institutional and commercial building in Kenya and Southern Sudan. According to their website "...is a team of Registered Architects who hold Bachelor of Architecture Degrees from University of Nairobi and have been working together on construction projects in Africa for many years. Our scope of work ranges from large commercial projects to intimate and personalised designs for private residences and no project is too large or too small to handle. It is our firm belief that the success of a building, whether aesthetically, functionally or financially, is established through the design process. It is in this process of lateral thinking that the talents, skills and energy of the practice is concentrated..."